ALL DALLAS COWBOYS CARDS AND POCKET SCHEDULES ARE $0.99. 1970 Topps #260 Calvin Hill (R), EX. 1970 Topps #228 Chuck Howley, VG-EX, (stain on reverse). 1971 Topps #8 Walt Garrison (R), VG-EX, (stain on reverse). 1973 Topps #243 Herb Adderly. 1973 Topps #421 Walt Garrison. 1973 Topps #159 Lee Roy Jordan. 1979 Police Bob Breuing, EX-NM. 1979 Police Robert Newhouse, EX. 1986 McDonald's #63 Glen Titenson, VG. 1986 McDonald's #54 Randy White, VG. 1986 Topps 1000-Yard-Club #18 Tony Hill, VG-EX. 1989 Pro Set #89 Michael Irvin. 1989 Topps #383 Michael Irvin. 1990 Fleer Dallas Cowboys Team Set. 1990 Pro Set #78 Troy Aikman. 1990 Pro Set #79 Michael Irvin. 1990 Pro Set #28 Tom Landry. 1990 Pro Set #84 Ken Norton (R), EX-NM. 1990 Pro Set #685 Emmitt Smith. 1990 Pro Set #800 Emmitt Smith. 1990 Pro Set MVPs #5 Chuck Howley. 1990 Pro Set MVPs #12 Martin/White. 1990 Pro Set MVPs #6 Roger Staubach. 1990 Score #597 Tom Landry. 1990 Topps #3 Troy Aikman, EX-NM. 1991 Domino's #6 Troy Aikman. 1991 Domino's #43 Roger Staubach. 1991 Fleer #423 Russell Maryland (R). 1991 Pro Line Portraits #85 Roger Staubach. 1991 Pro Set #128 Troy Aikman. 1991 Score #15 Emmitt Smith. 1991 Score #225 Troy Aikman. 1991 Score #631 Troy Aikman. 1991 Upper Deck Hologram #GB5 Emmitt Smith, EX. 1992 Pro Set Power sample Emmitt Smith. 1993 Action Packed #11 Troy Aikman. 1993 Action Packed #QB1 Troy Aikman. 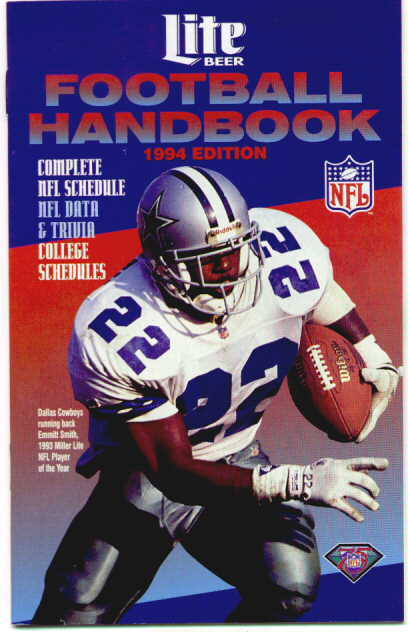 1993 Action Packed #RB8 Emmitt Smith. 1993 Fax Pax #17 Emmitt Smith. 1993 Proline Profiles #586 Emmitt Smith. 1993 Pro Set Promo Emmitt Smith. 1993 Upper Deck #421 Emmitt Smith. 1996 SI for Kids Deion Sanders, NM-. 1999 SI for Kids Deion Sanders, EX. 1999 Ad postcard Randy White. 1996 (Troy Aikman, Deion Sanders). 2009 (T. Romo, M. Barber, B. James, D. Ware, J. Witten). 1992 NFL Champions 18 oz. 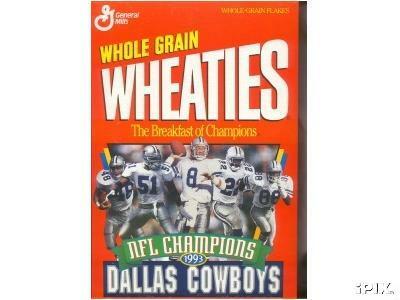 Wheaties Box (empty), $25. 1999 Dallas Sports Guide Magazine (Deion Sanders cover), $2.